When a driver makes the choice to drink and get behind the wheel, it can lead to tragic consequences. If you are a victim of DUI in and around Oceanside, California, the attorneys of The Rubinstein Law Group can help you build a strong case. Our DUI victim attorneys can answer your questions about car accidents and determine the full amount of compensation you deserve. To build the strongest case on your behalf, please call our Oceanside DUI victim attorney at 855-365-9955 to schedule your free consultation. Seek medical attention: Make sure any injuries you sustain are treated immediately and documented clearly. Find out and collect details about the accident, such as the name, license plate number and proof of insurance for the other driver, contact information for parties and witnesses, etc. Photos of the scene can be very helpful. 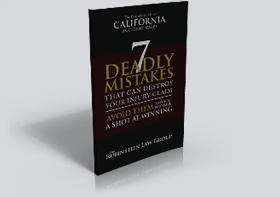 Establishing fault in a drunk driving case is a key issue. Your DUI victim attorney will have to prove that the driver was impaired at the time of the accident. An expert toxicologist might have to testify to this fact. Our dedicated Oceanside DUI victim attorneys can not only help you make a strong case against the driver, but also make sure you get what you’re owed from the insurance companies. Economic hardship through the loss of a household earner, job benefits, etc. Your family may also be able to pursue additional compensation through punitive damages. Punitive damages are additional monetary penalties that act as a punishment for the driver’s dangerous conduct. Please contact The Rubinstein Law Group today to schedule a free consultation with one of our seasoned DUI victim attorneys. Mr. Rubinstein serves clients in Oceanside, San Marcos and Escondido, California.